If you are having trouble deciding what is the best rangefinder for golf for you is, then you are in the correct place. In this article, we will discuss several golf laser rangefinder reviews including the pros and cons of each different rangefinder out there and try to pin down the best golf rangefinders. I tried my best to narrow things down. As you can see there is a comparison chart here that will take you straight to the best golf rangefinders. People looking for the best golf rangefinder or the best laser rangefinders quickly will find this list helpful when making a decision. What is the best rangefinder for golf? A rangefinder is a device which is used to measure the distance between the user and the target. It can be referred to as a Distance Measurement Device or DMD. It is most popularly used in golfing in order to measure the distance of the flag from the golfer. In order to make such effortless and accurate measurements, these golf rangefinders make use of either laser or GPS technology. The laser rangefinders determine the distance between the user and the target simply by sending a short pulse of the laser to the target and measuring the time it takes for the pulse to return back to the rangefinder. In order to determine distance using the time dimension, the speed of laser is kept fixed and doesn’t vary at any cost. All these calculations are done virtually instantly or in a matter of seconds and are displayed for the golfer to see immediately. On the other hand, the GPS rangefinders use satellite data to make the precise measurement of the distance between the user and the target. This is achieved by considering the longitudinal as well as the latitudinal coordinates of the positions. The biggest advantage of using a golf rangefinder instead of simply relying on your gut is that the rangefinder is highly accurate and the margin of error achieved by a rangefinder is well below the margin of error in case of no rangefinder where the golfer makes a guess. The major reason for opting into buying a golf rangefinder is that now you have access to the actual distance between you and your target and there is no room left for guesswork and errors. How does a Golf Rangefinder assist its users? Here are some of the ways in which a golf rangefinder assists its users and eventually improve the outcomes by enhancing the accuracy of each shot. Several rangefinders on the market today provide the slope functionality which proves to be very helpful for a golfer. Slope compensation isn’t possible when you rely on your gut and make a guess. It does, however, make a difference because elevation has an impact on the actual distance between the user and the target. By incorporating the slope compensation, the rangefinders are actually accounting for the change in elevation between the user and the target and help in enhancing the overall accuracy of the measurement. Rangefinders possess the ability to compute the distances within seconds or virtually instantly. This simply isn’t possible in case of human guesswork. Firstly, the guesses have a higher margin of error and secondly, the judgment takes time. Instead, the rangefinders provide a much faster and accurate solution. By reducing the margin of error and eliminating the process of guesswork and possible doubts, rangefinders definitely result in more accurate and reliable measurements. This further boosts the confidence of the golfer in making their shot without any kind of uncertainties. Did you know? There are golf rangefinder apps, that help you get more accurate info. Apart from the measurement aspect, a golf rangefinder can also be used to gather the distance data. By collecting all such data, you can analyze it and the more data you collect, the better you become in this area. With the help of past experience, the golfer can make decisions easily that are well suited to the current situation. This provides a huge advantage and greatly improves the overall performance of the user. What to look for in Golf Rangefinders? You need to be aware of certain concepts that act as factors which you need to consider before choosing the best golf rangefinder for your requirements. Let us help you sift through some of the essential factors that require your due consideration before you find the best golf rangefinder for yourself and make the right decision. The range can be referred to as the maximum distance at which the golf rangefinder can shoot reliably. Although several rangefinders claim to shoot at a thousand yards still some of them fail to stand by their words. This is because those numbers aren’t quite realistic due to the lack of powerful enough magnification. Knowing the maximum distance up to which the rangefinder can aim or focus and measure the distance helps the golfer in determining whether that particular rangefinder is suitable for them or not. An average range of more than 400 yards is quite decent and fair enough. Accuracy is one of the most vital criteria which needs your attention before you go and make a purchase in the rangefinder arena. The user needs to understand that however great the rangefinder must be, but if the numbers that it produces are all jumbled up and incorrect, then such a rangefinder is of no use at all. The measurements presented by the rangefinder must be quite accurate in order to be helpful to the user. Most golf rangefinders provide an average accuracy of plus or minus 1 yard. One needs to strike a good balance between accuracy and range. Once a user becomes aware of the range criteria, they seem to forget that there is another factor that needs their attention. A long range is totally worthless if you cannot even locate the target or see the target from your current position. Magnification should be powerful enough to enable the users to zoom in and focus on their target located quite far away from them without any complexity. The ideal magnification level and most popular among several golf rangefinders available on the market remains at 6x. Slope functionality enables a rangefinder to measure the distance to a target or a flag by incorporating the compensation for any kind of elevation change between the user’s position and the target. Some people claim that with the slope functionality, the rangefinder evaluates the actual distance to the target as well as the distance a shot will cover. You need to make a choice about whether or not you wish to include the slope functionality in your desired golf rangefinder or not. The choice needs to be made because the slope technology is considered illegal by some golf tournaments. If you do plan to purchase a rangefinder with the slope functionality, you can easily practice with slope but make sure to disable it when competing in a tournament to avoid being disqualified. When using a rangefinder, a golfer is required to move around the course quite a lot and for this reason, portability is an essential factor. Portability is achieved only when the size and weight of the golf rangefinder are ideal. The rangefinder must have a lightweight design and a compact construction in order to be extremely portable. The ideal weight for a rangefinder is around 6-8 ounces. In addition to the size and weight, the overall design of the rangefinder must be ergonomic and it should fit right into the palms of the user naturally. A golf rangefinder must be user-friendly and easy to use. If you are a newcomer in the field of golf and wish to purchase a rangefinder, the last thing you would want is to get baffled by all the complexities of a typical rangefinder. It is important that you choose a straightforward rangefinder that reduces the number of buttons and still manages to perform all the functionalities. The crucial point is that a golfer purchases a rangefinder to simplify their life and in turn, the rangefinder must do the same and not complicate things further. Speed is a crucial factor because it depicts how quickly the golf rangefinder can present the readings or measurements. It is extremely important for a golfer, whether or not they are competing that the readings are delivered to them in a matter of seconds. It should virtually be an instant response. Thankfully, the technology has made enough progress and has introduced smaller and faster microprocessors that can readily be installed in a rangefinder to drive down its response time significantly and increase its speed. Battery life needs to be considered while making a purchase because however powerful your golf rangefinder is if it dies down in the middle of your observation and leaves you hanging say during a tournament or a competitive course, all the money that you spent on that powerhouse would go down the drain. Most golf rangefinders currently on the market are able to last for at least a season. The CR2 lithium ion batteries are known to be quite great with a longer battery life. Also, make sure that the rangefinder offers the flexibility for you to replace the batteries whenever needed. Cost or price of golf rangefinders varies greatly based on the functionalities and features they have to offer as well as the brand name itself. It is important for you to set your budget straight before going in for making a purchase because there is something for everybody on the market that satisfies everyone’s budget. Also, you must ensure that you get the value for your money. You might find a rangefinder attractive but it might fall out of your budget significantly. So save yourself some time and effort and do the math before heading out for your shopping spree. But beware of the cheaper alternatives because it might sound nice to purchase a rangefinder that’s quite cheap but it might not be quite as reliable or accurate as its slightly expensive counterparts. The durability of a rangefinder ensures that the investment you made the first time you bought a rangefinder remains fruitful and doesn’t require you to make frequent visits to a repair shop or drive you to buy a totally new rangefinder altogether. A durable construction ensures that the rangefinder can take a tumble or two and still work perfectly fine. This factor definitely enhances the value for money received from a rangefinder. The golf rangefinder must always be approved by United States Golf Association or USGA to ensure that it can readily be used on tours and tournaments because such events require the USGA approval mandatorily. But this factor might not be as important for those users who wish to use the rangefinder for simply playing or practicing. A USGA approval further helps in achieving higher customer ratings due to the impression that it has been verified and approved by a credible authority. There is a vast presence of other technologies that can truly enhance the current performance of any rangefinder. Some of these technologies whether proprietary or not include the JOLT technology, Pinseeker technology, Vivid Display technology, etc. Further, there can be several other modes that a golf rangefinder can offer apart from the standard one such as a continuous scanning mode, a first target priority mode, etc. All of these technologies or modes enable a rangefinder to achieve better accuracy and precision as well as enhance the end result greatly. The Bushnell Pro X7 Jolt Slope Golf Range Finder is most definitely the best golf rangefinder with slope. It has been crowned the best golf rangefinder 2018 in our review. It possesses a binocular-style design making it ideal for those golfers who wish to get a stable shot when shooting from about 200 yards. This particular rangefinder is worth your every penny and does justice to the brand name and reputation of Bushnell in the optical equipment industry. The presence of magnificent 7x magnification and an accurate 550-yard range is a proof of its superb quality and performance. It is one of the most accurate golf rangefinders available on the market today and quite stunningly remains the most powerful rangefinder in the world. The accuracy achieved by the Bushnell Pro X7 rangefinder lies between 0.1 to 0.5 yard which is literally unbelievable. The extra magnification allows you to aim and make an accurate shot from up to a maximum of 550 yards. The addition of Pinseeker technology is commendable and enables you to lock the exact target that you wish to focus on and record its measurement instead of getting distracted by other background objects. This rangefinder also comes with Bushnell’s Extreme Speed Precision technology that is designed to provide a faster reading mechanism. The Vivid Display technology enables the user to adjust the display based on their personal preference as well as the surrounding lighting conditions. It offers four different brightness levels from BRT1 – BRT4 with BRT4 being the brightest. This makes it quite reliable under any kind of lighting and ensures a clear view and optimum performance regardless of how dark and gloomy the weather is. Further, it eliminates the glare, improves clarity, enhances contrast and also helps with light diffusion. The incorporation of slope functionality does wonders for this golf rangefinder. The slope functionality enables a rangefinder to record a measurement of the distance to the flag by including a small compensation for any kind of change in elevation between the golfer’s position and the flag. This leads to much more accurate and exact measurements. In terms of exterior design and overall construction, this rangefinder by Bushnell is slightly heavy than its counterparts but has an overall weight of 12 ounces that remains less than a pound so you shouldn’t worry about it being too bulky. The construction is quite sturdy and durable. Also, this rangefinder is completely waterproof which enables it to be used in all types of weather conditions. Further, to enhance the comfort of use and user-friendliness, this rangefinder has tried to minimize the number of buttons. Simply press the power button, focus and aim on your target and hold it in place to get an accurate recording of measurement. Also, the brightness can be adjusted by toggling the mode button. In terms of cost, definitely the Bushnell Pro X7 golf rangefinder is on the higher end of the spectrum, but all the power and premium features add to the cost and make it slightly expensive. If you are the type of user who doesn’t mind spending a fortune on a powerful rangefinder which truly is unmatchable with respect to its overall performance and quality, this rangefinder is completely suitable for you. In summary, despite being slightly larger and heavier than most of its competitors, its performance outweighs all such hurdles and make it a bestselling product worth your money. 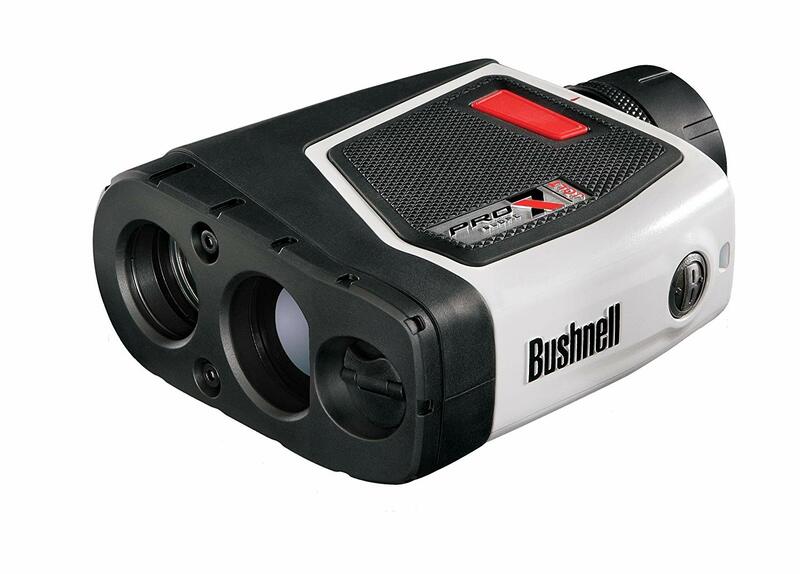 Bushnell is a well-established name in the optics industry and has produced several golf rangefinders over the years. 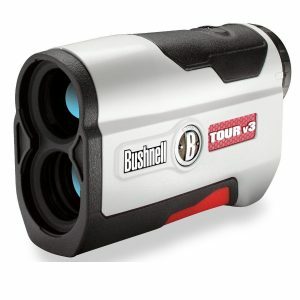 The Bushnell Tour V4 Jolt Golf Range Finder is actually an improvement over the Bushnell Tour V3 laser rangefinder. It is packed with several different features and has quite a compact and ergonomic design. In terms of performance, it comes loaded with HD optics, excellent 5x magnification and a big 24 mm objective lens. An attention seeking feature in the Tour V4 rangefinder is the Pinseeker technology along with the JOLT technology. JOLT technology is a proprietary technique by Bushnell which enables the golf rangefinder to produce a tactile feedback or a short burst of vibration in order to indicate that the rangefinder has indeed locked on a flag and an accurate measurement of the distance to the flag can be made. This way the users get a more precise and accurate measurement. When compared to its predecessor, Tour V3, this golf rangefinder is actually 30 percent lighter in weight and smaller in size. This level of weight and size reduction makes the Tour V4 rangefinder ideal to fit into your pockets so that you can carry it wherever you go. The ergonomic design makes it easy to use and enhances the convenience as well. The true attraction is the presence of a single button to control everything. Also, to complement the ergonomic design, a hole or a crevice has been placed at the bottom of the rangefinder which allows you to naturally rest your thumb and get a better grip over the rangefinder making it very difficult for the rangefinder to fall out of your hands. Further, the construction is water resistant which makes it rough and tough enough to be used under harsh weather conditions. But you need to be aware that despite being waterproof, it isn’t completely submersion proof and hence it can definitely work well in rainy conditions but cannot work underwater. All these features make this golf rangefinder by Bushnell quite robust. To facilitate flexibility and provide choice to its users, the Bushnell Tour V4 comes in two separate editions. The first one being the standard edition and the second being the slope edition. The slope edition has all the features and functionalities of a standard edition with the exception of an added slope technology that allows the user to measure the distance to the flag with a compensation for the slight elevation change between the user and the flag. This level of adjustment is welcome by every golfer but sometimes it might turn out to be illegal in some golf tournaments. To make the two editions more distinctive, the slope edition comes with a red trim at the front. The Bushnell Tour V4 comes with an improved focusing mechanism which delivers much better views and clearer images. It is fitted with a single slide focus ring above the eyepiece so that you can easily rotate it to adjust the focus. In terms of range, this golf rangefinder is quite versatile and provides a wide range of 5 to 1000 yards with an impressive accuracy of just plus or minus 1 yard. The Bushnell Tour V4 golf rangefinder also features a continuous scan mode for recording measurements of each target that you encounter as you pan through the entire course. Bushnell Pro X2 Golf Range Finder is a powerhouse compressed into a small body with the impactful addition of high-end technologies, innovations and some of the best features offered by Bushnell. It is a breeze to use the Pro X2 rangefinder. Along with the ease of use and comfort, there is an addition of slope compensation to this model that adds value. The slope compensation allows you to adjust your measurements based on the level of elevation or degree of inclination or declination. Also, it comes with a slope switch technology, which allows you to enable or disable the slope functionality easily so that you can take part in some golf tournaments that don’t allow the slope function legally. For making this kind of switch between the slope and the standard mode, you simply need to move the Pro X2 logo up and down. The Bushnell Pro X2 golf rangefinder also features a Pinseeker technology along with the JOLT technology. They enable the rangefinder to provide you with a tactile feedback in the form of a short burst of vibration to indicate that a lock onto the flag has been achieved. Also, it provides the user with an added confidence that the measurement is to the actual target and not just any other distraction from the background of the target. Further, this rangefinder uses the second generation Extreme Speed Precision or the ESP technology along with a fast focus and a 6x magnification for extremely accurate and superfast measurements. The 6x magnification is quite impressive and allows you to easily focus and zoom in on your target. It can be controlled simply by using a dial placed on the eyepiece. It also comes with a Dual Display Technology which allows you to toggle between black or red graphics based on your personal preference as well as the surrounding lighting conditions. Further, in terms of battery preservation and battery life, the whole battery usage process is quite efficient, to say the least. In terms of performance, the accuracy remains at a meager plus or minus half a yard which is quite phenomenal. Also, the range offered by this golf rangefinder lies between 5 to 1300 yards which is extremely impressive and some of the best in the market. This golf rangefinder by Bushnell is extremely strong, sturdy and high end in terms of optics and performance. 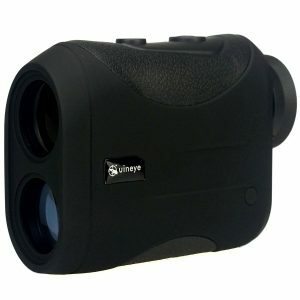 The rangefinder is encased in a rubberized armor and metal casing which makes it quite robust and ready for rough use. This also makes the golf rangefinder a waterproof product. Based on its features and functionalities, it is quite apparent that you won’t regret your decision to buy the Pro X2 rangefinder because of its first class performance and superb level of consistency. 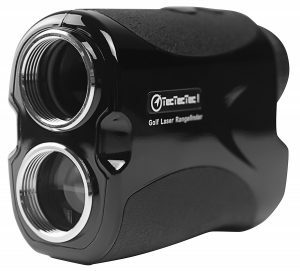 The TecTecTec VPRO 500 Golf Laser Range Finder is most definitely the best golf rangefinder for the money. It is a budget rangefinder that provides a great array of features with optimum quality that remains unquestionable. It duly offers a range starting from 5 yards moving up to a maximum of 540 yards with an accuracy of about a plus or minus 1 yard. 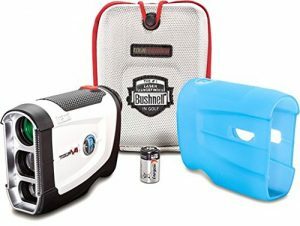 Although the maximum range isn’t quite as impressive as some other variants offered by Bushnell, it definitely is a good product on a whole and fulfills all the requirements of a golfer. Further, the 6x magnification adds to the performance and results in bright and vivid images. Also, this laser rangefinder makes use of Class 1 laser which remains eye safe and has an average power output of about 0.5 mW. The Pinsensor technology is a great addition and is meant to allow its users to be able to isolate different targets as easily as possible. This is definitely more useful in such situations wherein the flag is surrounded by the woods, trees, bushes, etc. This helps you isolate the flag even in the scenario where it is almost blended amongst the greens. Also, this golf rangefinder comes fitted with a fabulous through-the-lens display mechanism which provides you with an extra clear vision. In terms of optics, this laser golf rangefinder makes use of multilayer coated optics which enhances the end result significantly. It comes fitted with a 24 mm objective lens for enhanced clarity. Along with the multicoated optics, this rangefinder ensures a minimal amount of reflection to reduce distortion or blurring. For the convenience of use, this rangefinder by TecTecTec also displays the battery levels using the HUD display so that you are aware of the battery situation at all times. Also, it comes with a diopter adjustment functionality which makes it easy for you to adjust your optics based on nearsightedness or farsightedness. In terms of design, the construction is quite compact and lightweight with the overall weight being just around 200 grams and the dimensional measurement being 104x72x41 mm. Such a compact device fits right into your pocket and remains extremely portable where it can be carried anywhere you go. The ergonomic design definitely makes it easy to hold and comfortable in your hands. Also, the durability is maintained with a strong encasing. Further, the TecTecTec VPRO 500 golf laser rangefinder is completely waterproof as well as rainproof and can be used conveniently in any kind of weather condition. This rangefinder offers three separate scanning modes for more versatility. The users can easily make the switch between these three modes using a single mode button. The first mode is the First Target Priority mode which provides you with the measurement of the first object from amongst a group of objects. The second mode is the Continuous Scanning mode where the rangefinder continuously scans through the course in order to encounter various objects and record their measurements. The third and final mode is the very popular Pinseeker mode which enables the rangefinder to search for and lock on the target. But it must be noted that it doesn’t offer a tactile feedback when the flag is locked, as in the case of several Bushnell rangefinders that come equipped with their proprietary jolt technology. This rangefinder doesn’t offer slope technology and remains legal for all kinds of golf tournaments. Overall, the VPRO 500 golf rangefinder is a pretty good device with smart features and a budget price. Precision Pro is another newcomer in the golf rangefinder and other optical devices industry. It offers yet another power-packed golf rangefinder after it tasted success with its Precision Pro Nexus rangefinder model. This particular laser golf rangefinder is one of the cheapest rangefinders that you will find on the market with the set of functionalities and features that it offers. It can be defined as a first class product coming at a price of a third class one, just because it hasn’t built a brand name for itself yet. There are two models in this range namely the NX7 and the NX7 Pro. The only difference between the two is that the Pro version comes with an added functionality of slope. Given its lower price tag, golfers are bound to doubt its worth, quality, performance, build, reliability, etc. But the users are left stunned once they get their hands on this powerful golf rangefinder. The quality and precision amazes its users and is quite unmatchable in its class. The overall construction and design are quite strong yet elegant. The manufacturers have struck a great balance between compactness and comfort. The design is quite user-friendly and fits right into your hands quite naturally. The overall weight of just 5.4 ounces keeps it quite lightweight, making it extremely portable given that it is at least 25 percent smaller in size than its predecessor. 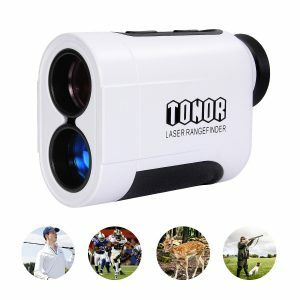 The ease of use and user-friendliness is one of the major attractions of this laser golf rangefinder, where you simply need to push a button to turn on the rangefinder, locate and aim at your target and once again press the same button to capture the reading of the distance to the target. Further, the convenience of use is enhanced by providing the users with the ability to switch between two modes i.e. the standard mode and the slope mode wherein slope functionality can easily be enabled or disabled as per the user’s wish. Also, it enables the users to make a switch between the measurement units of yards or meters. For added comfort, the eyepiece has an adjustable focus as well. In terms of its performance, the maximum range offered by this laser golf rangefinder reaches up to a maximum of 400 yards with an accuracy of a meager one-tenth of a yard. Despite its small and compact size, the rangefinder doesn’t compromise on the accuracy and performance and provides a superb 6x magnification for enhanced visuals. 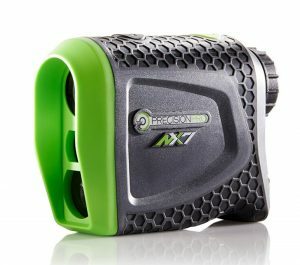 Another great feature offered by the Precision Pro NX7 Laser Golf Range Finder is the Pulse Vibration Technology. This technology enables the rangefinder to provide a tactile feedback in the form of a vibration when it has finally locked on the flag. Further, this rangefinder comes with Target Acquisition Technology which ensures that the yardage is actually the measurement up to the actual target and not any other distraction in the background of your target. On top of all these great features, this rangefinder also comes with free batteries which reduce the cost of spending an extra buck for buying new batteries. This particular rangefinder by Precision Pro is most definitely a quality product with consistent and reliable performance and deserves your consideration. Bushnell is a very popular and reputable brand in the world of optical devices such as rangefinders. It is known for its quality, design as well as performance and doesn’t disappoint with the Tour X Golf Rangefinder. One of Bushnell’s premium products, the Tour X boasts a whole lot of new features. The interchangeable faceplates will let you change it from being able to measure distance only, to distance and elevation. A very powerful pin locator paired with Bushnell’s Jolt Technology makes finding and confirming your pin very easy and vibrating slightly when locked on. Also known as one of the best laser rangefinders. This is for someone who loves to have the gadget with all the added bells and whistles. One of the best golf laser rangefinders. 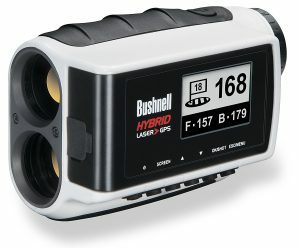 This particular rangefinder by Bushnell has an array of features that it offers with one of the unique features being the ability to interchange the faceplates. This functionality allows you to enable or disable the elevation measurement or advanced slope functionality. By disabling the slope mode, the rangefinder remains legal for golf tournaments where the slope isn’t accepted and when you wish to switch back to the slope mode for practice, you can easily do so by enabling it. More specifically, the black faceplate disables the slope mode to maintain the golf rangefinder’s legality in several golf tournaments. And the red faceplate enables the slope mode allowing the rangefinder to compute the distance along with a compensation for the slight change in elevation between the golfer and the flag. Also, to help the user install the correct faceplate and not get confused and eventually end up being disqualified in a tournament, the manufacturer has added a ‘Do Not Conform’ message on the front of the red faceplate to indicate that this faceplate doesn’t conform with the legal restrictions of some of the golf tournaments. 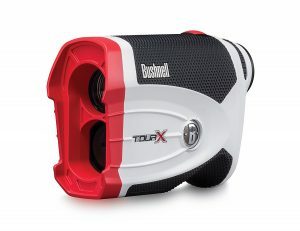 The Bushnell Tour X Golf Rangefinder also comes with Bushnell’s most popular and patented JOLT technology. The JOLT technology is a great addition to an already excellent golf rangefinder which provides a tactile feedback or a slight vibration when you finally lock on the flag. The minor vibration indicates and provides the users with a reassurance that an accurate measurement of the distance to the flag has been recorded. Another exceptional feature provided by the Bushnell Tour X Golf Range Finder is the Dual Display Technology. This technology allows you to switch the display between the red and black graphics based on the surrounding lighting conditions as well as your personal preference. The switch can be made simply by using the Vivid Display sliding switch located at the back of the rangefinder. In terms of external design, this golf rangefinder is quite compact and lightweight with a robust casing to make it strong, sturdy and ideal for rough use. The addition of a rubber grip provides its users with a strategic non-slip grip on the rangefinder which further acts as a shock absorbent as well. For further assistance in holding the rangefinder correctly and easily, there is a thumb hole at the bottom of the rangefinder. These features provide the Tour X rangefinder with a stylish, sleek and premium look. In terms of optical range, the Tour X golf rangefinder offers a range starting from as low as 5 yards up to a maximum of an unbelievable 1300 yards. It comes with a stunning 6x magnification and HD optics to ensure brilliant and clear visuals. Further, this rangefinder provides an accuracy of plus or minus half a yard, which is superb. Overall, the optical quality, performance, accuracy, versatility and long range of the Bushnell Tour X Golf Range Finder is worthy of its price. Ergonomically designed to fit perfectly in your hand. With the contoured rubber grip making holding it so much more comfortable. Interchangeable faceplates will make the Tour X go from being legal for competitions, when measuring distance only, to illegal for competition when using the elevation measurement as well. This interchangeable functionality is fully legal with golf’s governing body. The changeable color of your instrument’s display, to help with various lighting conditions. Quality does cost more and is one of Bushnell’s premium products this will set you back a fair bit. Introducing the contender from Nikon, boasting a 6 550-yard optic lens. This is the smallest, lightest rangefinder that Nikon make. I was thinking of making separate Nikon rangefinder review but instead, I just added it to my golf rangefinder reviews. This one will show you everything that Nikon can offer you. Has amazing clarity, almost better than the real world, especially when zoomed in. One of the best laser rangefinders there is and best golf rangefinders hands down. 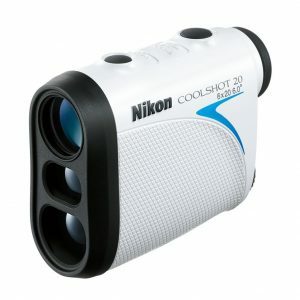 The Nikon Coolshot 20 Golf Range Finder is nothing short of what Nikon represents and has built its reputation around. It comes with superior quality, speed, and precision quite suggestive of Nikon devices. It is a powerful USGA approved golf rangefinder with a compact and lightweight construction. With an overall weight of just 4.4 ounces and compact dimensional measurement of 9×7 cm, this golf rangefinder is one of the smallest laser rangefinders on the market currently and can easily fit into your pocket which makes it extremely portable as well. You must keep in mind that the small size or compact design is an advantage and doesn’t have any kind of bad impact on the accuracy or optical quality. Despite the small size, it has an impressive accuracy score of less than even one yard and provides a range of 6 yards up to a maximum of whopping 650 yards. In terms of optical quality, the 6x magnification doesn’t fail to impress you and provide extremely clear, bright and vivid images. It ensures a clear vision of all the target objects, however far they may be. Also, this rangefinder comes with high precision making it easy for you to measure the exact distance to several different objects across the course. One of the cool features of the Nikon Coolshot 20 golf rangefinder is the 8-second continuous scan mode which allows the user to quickly scan and measure the distance to multiple objects in an 8-second time span. This feature comes in very handy when you are looking to measure the distance of very thin, small or multiple objects at a time. Rather than focusing individually, one can pan across the course and continuously make measurements for up to 8 seconds at a time. Further, the First Target Priority mode enables the users to quickly and accurately single out the flag from several background objects. It helps you focus on the first target encountered in your line of sight by ignoring the rest of the objects in the background. This feature further enhances the precision of this golf rangefinder. Another added benefit of the compact, lightweight and ergonomic design is the ease of use. Such a design makes this golf rangefinder by Nikon pretty easy to handle and move around with. This rangefinder also provides you with the ability to switch the measurement unit between meters and yards. At the press of a single mode button, these settings can be toggled easily. It also comes with an auto shut-off feature for enhanced battery preservation. The device automatically shuts down after ten seconds of inactivity preventing your batteries from running out. Also, the presence of a battery status notification enables you to be constantly aware of the amount of power remaining in your rangefinder. Another cool feature of the Nikon Coolshot 20 Golf Range Finder is that it has a rainproof and waterproof design, making it ideal for use in any kind of weather condition. To enhance its weather resistance, it has a wide temperature tolerance as well. This golf rangefinder makes use of Class 1 Laser for improved performance. It is quite clear that Nikon Coolshot 20 is a very versatile, superior and compact rangefinder which is worth your time and money. Small and lightweight, so it won’t take up much space in your golf bag. Very quick. Picks up the information you need very quickly and displays in an easy to view way. Can measure multiple targets very quickly with the inbuilt continuous scan function. Very well priced, some would say ‘too good to be true’. One of the best golf rangefinders. Looks very nice with a very nice feel in your hand. Ergonomically designed to be your hands best friend. Not waterproof, so playing in rain will not be an option for this device. The range is not as far as other devices, struggles to locate a pin over 200-yards away. Nikon support can be a hassle if you are trying to get hold of them. The TecTecTec VPRO DLX Waterproof Laser Golf Range Finder can easily be considered as the best golf rangefinder under 200. It provides you with a long range of up to 600 yards that is quite impressive along with the margin of error remaining at just -1 or +1 yard. This level of accuracy is quite stunning and establishes this golf rangefinder as a reliable device in the eyes of golfers and other users. It comes loaded with Pinsensor technology that allows you to easily measure the distance to your intended target in case of overlapping objects. The pin seeker technology no doubt has been used in other rangefinders as well, but the one used in this particular golf rangefinder is ultra-sensitive and highly accurate. You can easily measure the distance to the flag with better accuracy even when it is surrounded by trees, bushes or other similar distractions. In terms of optical components, quality and performance, this rangefinder performs superbly by making use of multilayer coated optics and a magnificent 6x magnification capability which comes from some of the best optics you will find on the market today. This results in an optimum level of clarity and brightness of images and vivid views. Also, it comes with long-lasting CR2 lithium ion batteries and is encased in a totally waterproof chassis for enhanced weather resistance. You must ensure that your rangefinder can work accurately in any kind of weather condition once you are out on the course. Weather resistance ensures that you can use your golf rangefinder even on rainy days without any significant effect on its overall performance or durability. But you must be aware that being waterproof or weatherproof doesn’t mean that it is submersion proof and must not try to expose it to submersion prone conditions. Further, the use of eye-safe Class 1 laser is quite intriguing and innovative. In terms of range, this rangefinder can easily be categorized as a long distance rangefinder with extremely high accuracy. The maximum range reaches the mark of up to 600 yards that is quite impressive and has the potential to reach 900 yards in case of reflective targets, but it might decrease slightly in harsh weather conditions such as fog, rainstorm, etc. This golf rangefinder also has a great through the lens display which is a plus when using the device in continuous scanning mode. 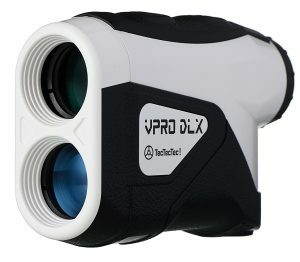 The TecTecTec VPRO DLX Waterproof Laser Golf Range Finder provides you with three separate scanning modes. Out of the three modes, the first one is the pin seeker mode which allows your range finder to distinctly identify and focus on the flag even when it stands amongst a group of distractions. The second out of the three modes is the First Target Priority mode which tries to show you the distance of the closest target out of a group of objects. This mode also helps you single out and measure the distance to the flag when it is surrounded by trees, bushes and other similar distractions in the background. The third mode is the continuous scanning mode which allows the user to scan the whole course using the rangefinder and continuously update you on the distance to different located targets across the course. With the absence of slope functionality, this model is completely legal for use in any kind of golf tournament. Serene Life is a pretty new brand name in the golf rangefinder market and has a lot to prove before it becomes a popular and household name. It doesn’t provide an array of products like some of its competitors but has proven its mettle over time through one of its most successful product yet, the Premium Golf Laser Range Finder. This golf rangefinder by a brand new entrant in the optical and rangefinder market is a stylish and sleek model. Along with a great design, it comes loaded with magnificent technologies and functions as well which lure golfers into buying this relative newcomer instead of some of the other popular ones. The incorporation of the slope and pin-seeker technology was a masterstroke by Serene Life to ensure a great experience for the golfers. It is one of the smallest and lightest golf rangefinders available on the market today and has an overall weight of just 0.4 pounds and the dimensional measurement of about 4×1.6×2.9 inches. Due to the small size, compact design and lightweight construction, it can fit right into your pockets making it extremely portable. Also, it comes with a single button to control all functionalities with the simple aim of enhancing the usability and convenience. The material composition for this particular golf range finder includes Acrylonitrile Butadiene Styrene or ABS which makes it quite strong and sturdy as well as ideal for rough use. Also, this composition makes it water resistant and hence weatherproof but you should be careful not to submerge it in deep waters since it isn’t submersion proof as well. The Serene Life Premium Golf Laser Range Finder provides you with a range starting from 5.5 yards up to a maximum of 546 yards with an accuracy of plus or minus 1 yard. This level of accuracy remains consistent and makes this rangefinder a reliable piece of equipment. Further, this golf rangefinder comes with a 24 mm objective lens for superior quality and a magnificent 6x magnification capability to zoom in on your target effortlessly that are placed quite far away from you. Also, this golf rangefinder provides the user with the flexibility to choose the unit of measurement in yards or meters. One simply needs to hold down the power button for three seconds in order to toggle between these two measurement units. The incorporation of Pin Seeker technology is a major plus for this newcomer model and helps the user easily locate and focus on the flag out of a group of other distractions by cutting and filtering the background distractions out from the focus. This is especially useful and essential in situations where the flag cannot be located with the naked eye. 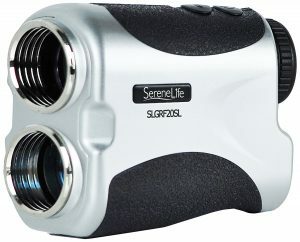 Another pioneering technology addition to this laser golf rangefinder by Serene Life is the Slope functionality. This allows the rangefinder to provide readings that include a certain compensation for any kind of change in elevation between the user and the flag or target. But the user especially golfers must be aware that this slope functionality is considered illegal in some golf tournaments and cannot be used altogether. Further, this golf rangefinder comes with CR2 lithium-ion batteries so you don’t have to shell out extra money to purchase them separately. The Serene Life Premium Golf Laser Range Finder is a newcomer in the rangefinder arena and is a great device that is packed with powerful features with half the price of some of the other popular rangefinders from well-established brands. Another quality Bushnell product and best rangefinder for golf. Aimed at those who want to have it all but not at the price of the Tour X. It is slightly more expensive than its competition in the legal rangefinder market, it doesn’t have a slope compensation. Like all new Bushnell products, it features the Jolt Technology which vibrates when locked onto a pin. Also a great golf driving rangefinder. It has a higher magnification capability of about 6x which results in brilliant and vivid images. The accuracy is superb at plus or minus half a yard and the range offered by this rangefinder is quite dynamic lying between 5 and 1300 yards. Also, it offers a pretty wide field of view. Apart from a great optical performance, the design and construction are super sleek and ergonomic. The exterior casing is non-slippery and quite sturdy. The rubber armor provides a solid grip and enhanced durability. The addition of Pinseeker technology has added great value to its feature set and improved this rangefinder’s functionality by a ton. It helps a user pinpoint the target out of several different distractions and finds out the accurate measurement of that target. The Extreme Speed Precision or ESP makes user experience all the more interesting and fast. The JOLT technology enables the users to maintain a steady lock on their targets by indicating through vibration when a stable lock has been achieved. This rangefinder also offers four different levels of display brightness and incorporates a vivid display technology. It also features a compact and lightweight construction with an overall weight of just 7.9 ounces which makes it quite portable as well. 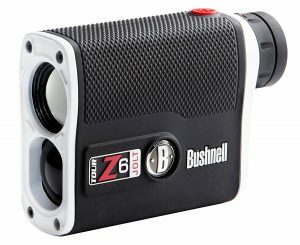 The Bushnell Tour Z6 Golf Laser rangefinder lies in the middle price range and offers an array of features and functionalities along with outstanding performance and durability. It is definitely a great performer and is worth your time and consideration. Protective shell will keep it waterproof and safe. Featuring rubberized ergonomically fitted sides that will make the Z6 feel like it belongs in your hand. Jolt Technology makes finding the pin simple as it will vibrate when it has locked on. Amazing range, being able to find a pin at well over 300-yards. There is no multi-scan option. It only gives you your details for a short period of time. It is pricier than the other rangefinders offered by competitors. Like on other devices the Jolt can take time to kick in sometimes, showing you that it is not an essential item, just a very nice add-on. Even with these cons you’ll still find it to be one of the best golf rangefinders. 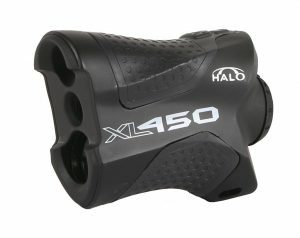 The XL450-7 Golf Laser Range Finder from Halo is a super affordable piece of golf laser rangefinder currently available on the market that does quite well for the money you pay for it. It is comfortably the best cheap golf rangefinder. It can display the target objects comfortably up to a range of 450 yards for reflective targets and around 300 yards for non-reflective ones. The 6x magnification capability of this golf rangefinder is magnificent and allows you to zoom in on your target as easily as possible. Further, this rangefinder provides greater accuracy with a line of error of only about -1 or +1 yards. An eye-catching feature of this golf rangefinder is its odd yet unique shape or design. The design is unique in the sense that it tends to take the shape of your grip and imitate it as closely as possible. This level of creative design makes this rangefinder super comfortable to hold and use. Also, this golf rangefinder is quite lightweight and compact, with an overall weight of just 5 ounces and the size measuring around 8.5×2.5×6.5 inches. Apart from all these fabulous functionalities and features, the Halo XL450-7 Golf Laser Rangefinder is completely waterproof, fog proof and weather resistant. The use of CR2 lithium ion batteries is a plus as well. But one of the major downsides for this model is poor eye relief, making it unsuitable for glass wearers. The TONOR Golf Laser Range Finder can easily be considered the best golf rangefinder under 100. It is super affordable and ideal for tight budgeters, who wish to purchase good quality products at cheap and affordable rates. This golf laser rangefinder might be slightly cheap, but that is not the case in terms of its quality and performance. It is capable enough to offer you a display range of a whopping 600 yards effortlessly with the added convenience of readings within seconds. It has provisions for two measurement units namely yards and meters which the user can adjust according to what suits them the best. Further, it provides you with a margin of error of a meager -1 or +1 yards. Also, it comes with an LCD display and a magnificent 6x magnification. The use of a 24 mm objective lens makes a world of difference and the overall viewing experience is unmatchable in its class.This golf rangefinder by TONOR is super lightweight and compact with an overall weight of just 190 grams and the dimensions of 105x73x40 mm. You must be aware of the fact that this rangefinder is a vertical finder and has no curvature to it whatsoever. Further, it is completely waterproof and shockproof which makes it ideal for use in rough and rugged conditions and almost all weather conditions. Also, it employs a CR2 lithium ion battery for better results.The icing on the cake is the fact that this golf laser rangefinder by TONOR comes preloaded with a mode specifically designed for golfers. Nikon has been a player in the optical equipment industry for quite a long time and has made a name for itself with an undisputable reputation. 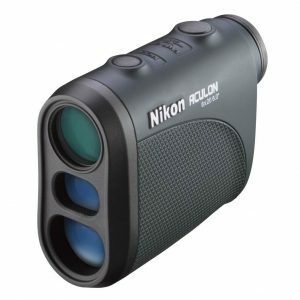 And the Nikon 8397 ACULON AL11 Laser Golf Range Finder definitely lives up to the quality and brand name of Nikon. This golf rangefinder is quite versatile and flexible in terms of the visual range offered by it which ranges from 5 yards up to a maximum of 550 yards. It is definitely the best value golf rangefinder on the market. The optical components are superb with a 20 mm objective lens being used within it along with multicoated optics and 6x magnification which provides a magnificent camera quality and an uncluttered display. Further, this rangefinder comes with a long eye relief of about 16.7 mm which is fantastic for people who wear glasses as well as for those with diminished vision. This golf rangefinder by Nikon is super lightweight and compact with an overall weight of just 6 ounces and the overall dimensional measurement of about 3.6×2.9×1.5 inches. Also, it comes loaded with a CR2 lithium ion battery and is completely waterproof as well. A unique feature called the Distant Target Priority mode is a huge selling point in this particular model of the laser golf range finder. This mode enables a user to focus on the farthest target object amongst many like it which could have been obstructed by trees, glass or other similar kinds of distractions. 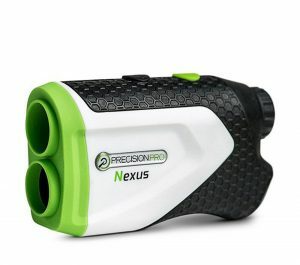 The Precision Pro Golf Nexus Laser Range Finder is the best budget golf rangefinder currently available on the market. This particular golf rangefinder is quite impressive and is very popular because of the features packed into it at the affordable price that it comes at. This laser golf rangefinder provides a maximum target display range of up to 400 yards with a meager margin of error of about -1 or +1 yard. Also, it comes with the Advanced Target Lock feature as well as a Scanning feature which is an innovative addition to the existing laser golf range finder. The Advanced Target Lock function is mainly focused on helping you filter out the background noise by providing you with the distance measurement of the flag instead of the distractions such as trees behind that flag or target. And the Scanning function is focused to ensure that you have different measurements when you need them.This laser golf rangefinder by Precision Pro is stunning in terms of optical performance and quality. It provides a great 6x magnification capability and 1/10 yard measurements for optimum quality and control. The design is quite sleek, lightweight as well as compact and has been cleverly designed to fit right into your hands perfectly due to its strategically placed curves. Also, this golf rangefinder comes with the expensive CR2 lithium ion batteries and a 1-year warranty from Precision Pro. One of the biggest advantages of this laser golf range finder is the super-fast and accurate focusing which allows you to acquire your targets quickly and with greater precision and accuracy. The Bushnell White Hybrid GPS/Laser Golf Rangefinder truly lives up to the name created by Bushnell in the optical equipment industry and is a remarkable product. It is a notch above the rest of the golf rangefinders in its class and can definitely be considered as the best golf GPS rangefinder currently available in the market. The White Hybrid GPS/Laser Golf Range Finder offers a flexible range starting from 10 yards up to a maximum of a 1000 yards which is quite impressive. Also, it provides a margin of error of about -1 or +1 yards which is a steal in terms of accuracy. This particular golf rangefinder also has the ability to lock in on the target and vibrate after a perfect aim which lets the golfer know that they have a steady lock on the flag and can prepare to take their shot. This rangefinder by Bushnell also comes loaded with innovative additions such as the pin seeker technology, auto course recognition as well as the auto hole advance feature which makes for a smoother and efficient reading process. But the most popular and unique selling point of this particular golf range finder is the use of GPS technology. But you need not worry about the possible absence of the traditional laser technology because it hasn’t been done away with at all. Instead, this model is a hybrid between both these technologies and tries to gather the pros of each one of them as efficiently as possible. Further, this hybrid golf range finder by Bushnell comes preloaded with over 3000 courses which makes it a smart buy. The Bushnell Tour V3 has a lot to live up to after its predecessor and is one of best golf rangefinders, the V2, was considered to be the best and the go-to rangefinder in the Bushnell’s range. And boy is it worthy of being the successor. With its updated look and feel, it is most certainly eye-catching! The Jolt has the Jolt Technology that vibrates when you lock onto your target. Known as one of the best golf laser rangefinders. This rangefinder offers everything you need out of a standard rangefinder including 5x magnification, pinseeker technology, the accuracy of just plus or minus 1 yard, scan mode, JOLT technology, etc. The scan mode is especially useful to scan the terrain and make a decision about the type of landscape for the course. Ergonomic Design. Fits perfectly in your hand. It is very fast! and still considered one of the best golf rangefinders. The laser can pick up targets at even further ranges! No need for using intermediate targets to measure a distance. A range of 1000 yards with a 1-yard accuracy. Reasonably priced for what you get. A tour legal basic rangefinder. Users may wait longer than necessarily need to, waiting for the Jolt function to go off. This could actually hamper the overall speed of golf play as people wait for the vibration. As nice of a function as this is, it isn’t a vital function. Has decent golf laser rangefinder reviews. 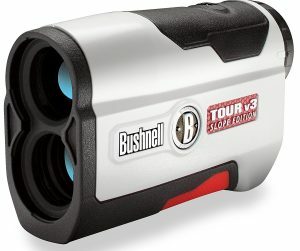 The Bushnell Tour V3 Slope has the same inner working as the Jolt, it just has the added advantage of slope compensation, which helps figures out the distance more accurately when there is an elevation change.Slope compensation does mean that this rangefinder is NOT competition legal, so would only be for weekend golfers. One of the best rangefinder for golf and just overall best golf rangefinder. The speed! It measures your distances quickly. Both on a slope and on flat land. The slope compensation is wonderful as even if you think it is flat there is often a small gradient that you would not normally be aware of. Designed to sit perfectly in your hand and be as comfortable as possible. 1000-yard range, with an accuracy of one yard. Shell keeps it from getting damaged, with rubberized sides, to help absorb any drops or accidents. It is not tournament legal due to the slope compensation feature. Jolt can take a while to kick in. The V3 Slope can have trouble locking onto the flag at over 200 yards. The Uineye Rangefinder is a light, small companion that you can keep in your golf bag. It is small, so it doesn’t take up much space at all. The Uineye has an amazing optic ability, being able to see things over 1500 yards away with a superior accuracy to its competition. 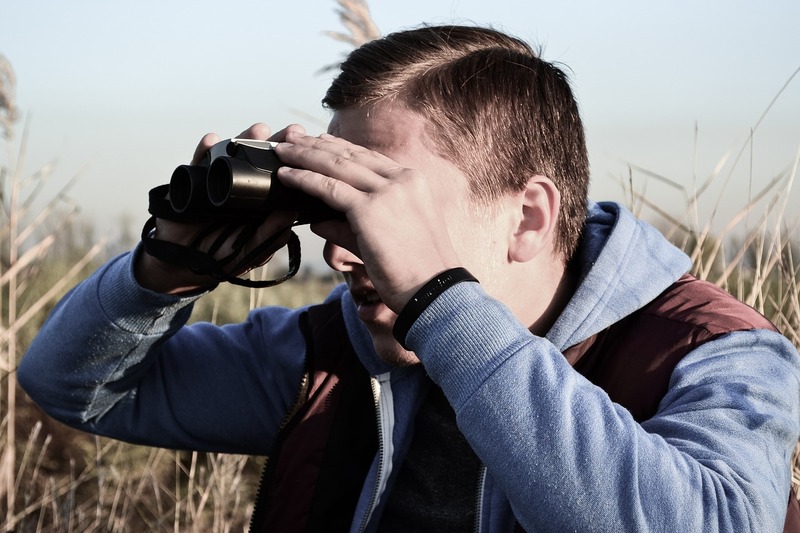 This rangefinder has amazing versatility, meaning that it can also be used for hunting. This is a really solid and reliable little device that fits into a small space in your golf bag. This item had to be added to my golf rangefinder reviews and best golf rangefinders out there. In terms of accuracy alone, this golf rangefinder stuns everybody by providing the accuracy of about plus or minus 0.33 yards, which is quite impressive in its class. The operations are quick and simple due to a user-friendly design. The presence of a continuous scan mode is quite helpful and helps the user get measurements of each object it encounters while panning the whole course. Also, for enhanced performance, this rangefinder makes use of multicoated optics. On top of excellent performance, this golf rangefinder also boasts of an ergonomic design and a portable construction. Overall, for the price that you pay for it, the Uineye Golf rangefinder is really a steal deal. Cheap! But still very good value for money. A range of up to 1600 yards, with 0.33 yards’ accuracy. Multiple measurement modes. Able to detect distances, angles, height and horizontal distance measurements. Multipurpose, can be used for hunting or golfing. Although there are not many cons to the Uineye golf rangefinder, it does have problems if there are objects in its line of vision. A single twig can trouble the rangefinder and make it show incorrect readings. Not waterproof or water resistant so it cannot be used in the rain. This had to make it into my golf laser rangefinder reviews. The Laser Link Red Hot 2 is a different choice when it comes to golf rangefinder reviews. It features a pistol shape, that Laser link claim makes it unnecessary to put the rangefinder up to your eye. This worked well with pin flags that had reflective prisms but struggled on other items and flags without reflective prisms. Again one of the best rangefinder golf. 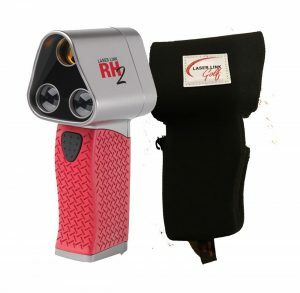 The Laser Link Red Hot 2 rangefinder is much lighter than its predecessor. It has an improved range of up to a 1000 yards which is quite impressive. With the help of a red dot, the aiming and targeting process becomes faster and more accurate. In terms of the exterior design, the ergonomic construction with rubberized grip ensures a comfortable hold. This golf rangefinder weighs just about 6.4 ounces and has a dimensional measurement of about 5.3x2x3.1 inches which makes it quite compact and lightweight. This rangefinder also provides you with a choice between the unit of measurement which is yards or meters. Such flexibility is appreciated by the user. With the presence of an LCD display, the measurements can easily be read by the user in one go. Interesting design means you don’t have to pick the rangefinder up to your eye, you just point and shoot. By not having to raise anything to your eye it should be easier to use, which it is. Doesn’t work well unless being pointed at an object with reflective prisms. Doesn’t have magnification as you not meant to raise it to your eye. Can be very slow. Not as quick to pick up on distances as its competition. Often have to lift it up to your eye to get the best results, thus making the design a little bit of a redundancy as this is what they were trying to avoid. 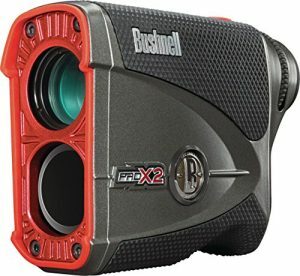 These laser rangefinder reviews will give you all you need to know about the GX-3i2. It is a high-quality rangefinder that in impressively quick, giving you everything you could need straight away in the best rangefinder for golf. 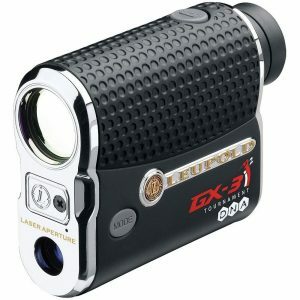 The Leupold GX-3i2 is perfect for golfers and hunters alike. This is an expensive unit that is well worth the price tag as it has all the extra add-ons that you could dream of. Sure is best rangefinder golf out there. Is surely part of my golf rangefinder reviews and one of the best laser rangefinders out there. This golf rangefinder boasts of great optics, sturdy construction, user-friendliness and cutting-edge technology such as PinHunter. It makes it easier for golfers with even the shakiest of hands to lock on the flag and get an accurate measurement. In terms of its construction, it weighs less than 8 ounces and is compact enough to fit right into your hands naturally, with a solid grip. In terms of performance, it is quite fast and delivers accurate results almost instantly. The biggest difference between this golf rangefinder by Leupold and other premium rangefinders is that it uses an OLED display instead of an LCD one. Such a display is quite versatile and can be used at any time of the day. Also, it is completely waterproof and hence weather resistant and can be used in all kinds of weather conditions. Can be used for both hunting and golf. Has Fog Mode, so you can play in all types of weather. Ergonomically designed to fit in your hand, with a rubberized exterior, making it more comfortable to hold and more drop resistant. Small and lightweight, easy to pack into any golf bag. Expensive! As this is a premium product expect to pay more for it. If you have the extra money it is highly recommended. Occasionally struggles to pick up the flag at over 300 yards, which still outranks many competitors. No matter what rangefinder you finally decide on, they will help your game undoubtedly. Now that you are aware of what a golf rangefinder is and the factors you need to consider while purchasing it along with some of the most popular models available on the market, it should be quite easy for you to figure out the right model for yourself. Hopefully, these golf rangefinder reviews have helped you decide which is the best golf driving rangefinder or just the best golf rangefinders overall for you. Golf rangefinders are pretty handy devices that assist the golfers perfectly thereby improving their overall golfing experience significantly. 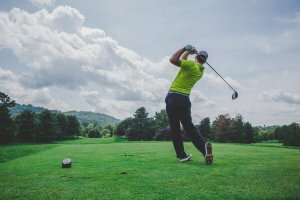 With all the resources at hand, once you are sure of your needs and requirements, you can make your decision about which golf rangefinder to buy. No matter what your final choice is you can’t go wrong. The best golf rangefinder is the one that suits your specific requirements and fits right into your budget.